The Otome genre is one that many people have preconceived notions about due to it being targeted towards a female audience. The cliché is that it’s full of hunky guys, young girls being swept away, and full of very sappy romance. Basically, the visual novel equivalent of a “chick flick”. The truth is, however, that many Otome novels have very complex characters, motives, and dilemmas. Hakuoki: Kyoto Winds certainly meets these criteria. However, as I read through this game for review I kept asking myself something. Is this really an Otome game? Or is it something more? 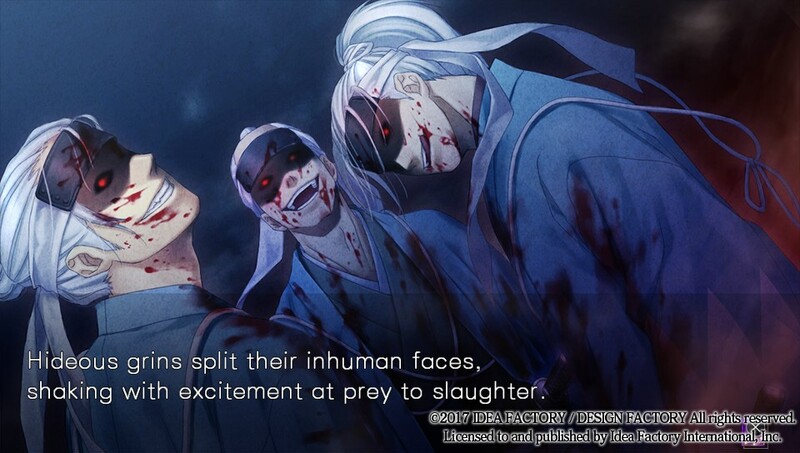 Hakuoki is a franchise developed by Idea Factory in Japan under their “Otomate” label. Consisting of several titles, Hakuoki is one of the heavy hitters in the Otome genre. While popular here in the West, the franchise shares an interesting trait with Neptunia: both series were originally localized by companies other than Idea Factory International. Before now, Aksys Games localized the franchise along with several other Otomate titles such as Sweet Fuse: At Your Side and Norn9: Var Commons. Kyoto Winds is the first Hakuoki to be published by Idea Factory International and the second Otomate game they have localized, the first being Amnesia: Memories. 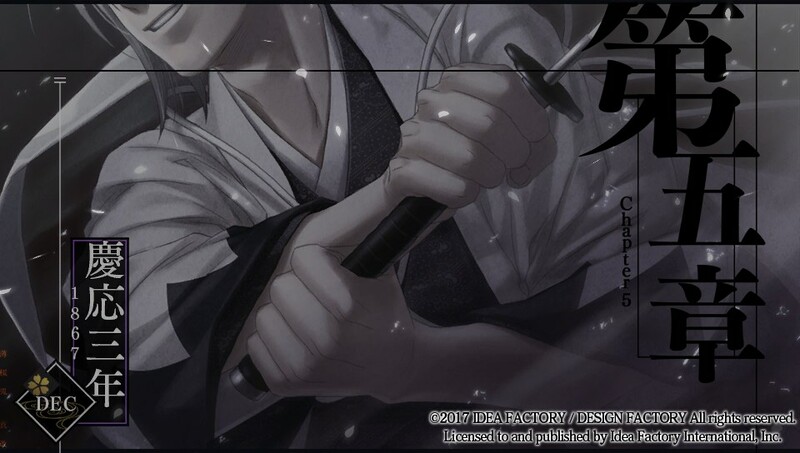 This doesn’t pose a problem, however, since Hakuoki: Kyoto Winds (known as Hakuōki Shinkai: Kaze no Shō in Japan) is a remake of the first game, Hakuōki ~Shinsengumi Kitan~. To be more specific, the first half of the game. Remember this for later. For now, however, let’s talk premise. Did I put in Corpse Party by accident? I thought this was supposed to be a cliche romance story! Hakuoki: Kyoto Winds stars Chizuru Yukimura, a young woman who goes to Kyoto to try and find her missing father. Realizing that a young woman traveling alone in 1860’s Japan is probably not a good idea, she dresses as a boy in order to protect herself. In Kyoto, she is attacked by a group of white-haired men in blue jackets. Thankfully, she finds herself saved by three captains of the Shinsengumi who protect Kyoto. However, they aren’t exactly here to be Chizuru’s friend and quickly arrest her for seeing the white-haired men… all without realizing her gender. After explaining her situation and revealing her gender, the Shinsengumi put Chizuru under house arrest. Both due to the previous incident and because they are also looking for her father. Thus, begins Hakuoki: Kyoto Winds and Chiziru’s quest not only to find her father but to survive the strange and chaotic world she now finds herself in. While we’ll touch more on the plot and Chizuru in a bit, let’s take a moment to talk about the visual component of this visual novel. I… I don’t even… What?! The visuals in Hakuoki: Kyoto Winds fall right in line with the pastel style that many Otome novels tend to use. In this case, it works well. Since the game is set in 1864 Japan, it gives the environment a very rustic look. It’s one of the times where having brighter and contrasting colors like in Neptunia wouldn’t work. The other thing I want to highlight are the visual effects. They look amazing on the Vita screen. 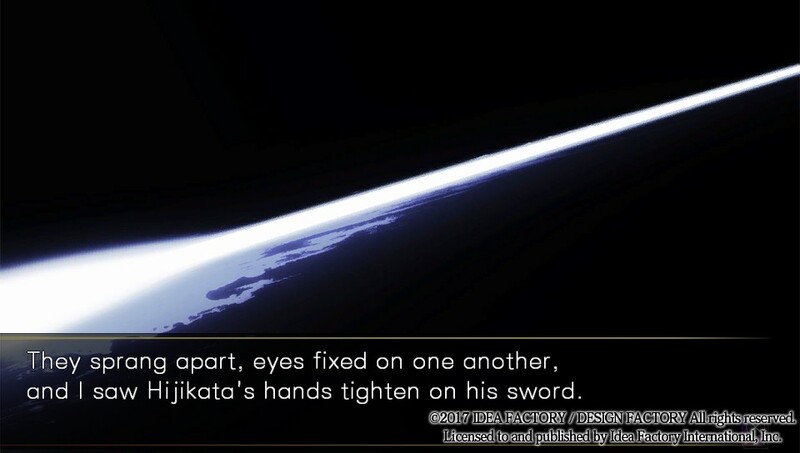 Cherry blossoms will flutter and sword battles will have flashes that dance across the screen. While on the surface this may seem simple, it brings these moments to life. Yes, this is a visual novel, but I don’t feel like I’m staring at flat images. It never really felt static, which is a good thing. Another thing that really shone was the sound design and music. Sound-wise, what stood out to me were the sword battles. The clash of metal-on-metal sounded convincing to me and I found myself feeling as if I was there. 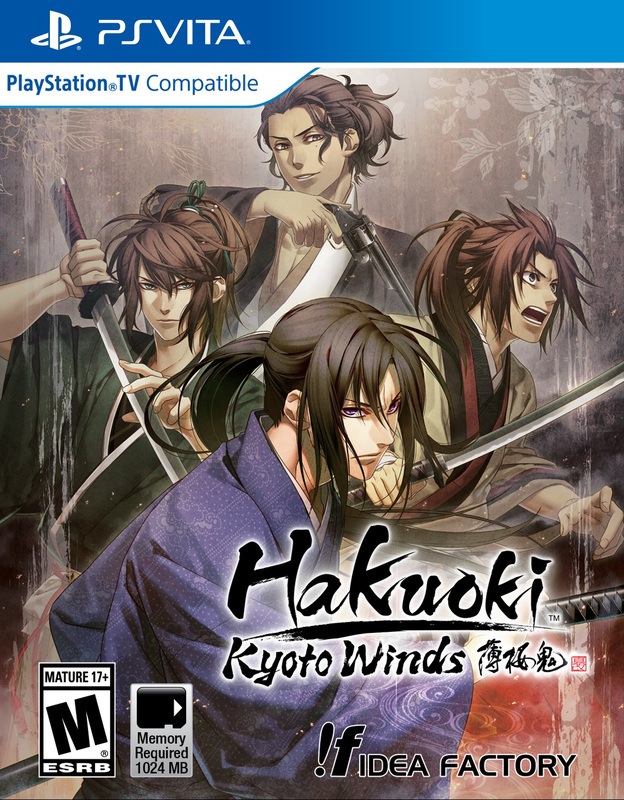 Musically, Hakuoki: Kyoto Winds is enjoyable. A lot of the music fits the atmosphere and time-period. In addition, there a few tunes that were just fun to listen to on their own. Regarding the voice acting, everyone turns in a great performance and you’ll probably recognize a few of them. Having just played Super Robot Wars V I recognized Shinichiro Miki voicing Toshizo Hijikata, which was a pleasant surprise. As good as the aesthetics are though, a core part of a visual novel are the routes and choices available to you. 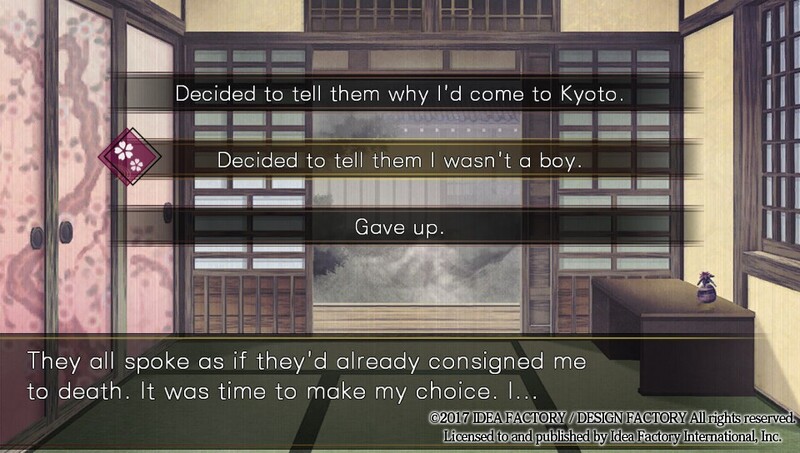 In Hakuoki: Kyoto Winds’ case, there are quite a lot of choices. However, is that good or bad? Hakuoki: Kyoto Winds has 12 different bachelors, each with three endings (bad, neutral and good). There’s also one normal ending for a total of 37 endings. That’s quite a lot of reading to do, or so you’d think. The trick Hakuoki: Kyoto Winds’ uses to prevent the story from being overwhelming, is that most of the game follows the common route. For those who don’t know, the “common route” is what’s used to indicate the part of a visual novel that is shared among all characters. Normally it’s used to set up the overall plot and introduce you to each character. Eventually, you’ll pick a character the plot splits off to deal with that character’s own issues. It helps to give each route a unique feel. A good analogy for this and how Hakuoki: Kyoto Winds handles it would be a river. See those choices? There are a lot of them to make over the course of the game, but at the end, you’ll always be brought back to the main plot. The river itself can be thought of as the common route. As you flow down it, you’ll eventually come to branches and choose a direction. Sometimes these branches flow back into the main river, but usually, they go their own way. Hakuoki: Kyoto Winds, however, has many of these branches flow back into the main river. While character specific events do occur and help develop the cast, you’ll always be brought back to the common route. Everything follows this path, even the endings follow this formula. The game consists of five chapters. While the fifth chapter will change somewhat depending on the route, the result is that once again the story flows into a common point. To continue our analogy, it’d be like the river breaking into 12 branches and they all still flow into the same lake. In this case that lake is Hakuōki Shinkai: Hana no Shō or the second half of the original Hakuōki ~Shinsengumi Kitan~. This is where a lot of issues about this game really stem from. While you’ll be rehashing quite a bit, thankfully the game does let you know what bachelor’s Chapter 5 you made it to via these images. If you’ve never seen it, you know you’re on a new path. The big issue here is that everything starts to feel the same. Once you’ve cleared your fourth or fifth bachelor, you can call out the key plot points that going to occur in each character’s chapter 5. While the specifics do differ because the ending must lead into Hana no Shō the game feels very repetitive. Thankfully the visual novel staple of being able to skip previous read is available so Chapter 5 is the only part you’ll have to do a lot of rehashing in. If you know what choices you need to make, you can quickly get to each bachelor’s events. Even if you don’t use a guide, the game features a very convenient quick save and quick load using the L and R buttons. It helps a lot with backtracking or checking to see if there’s anything new down a certain path. While the game may be mainly common route, if it’s interesting that’s not a problem. 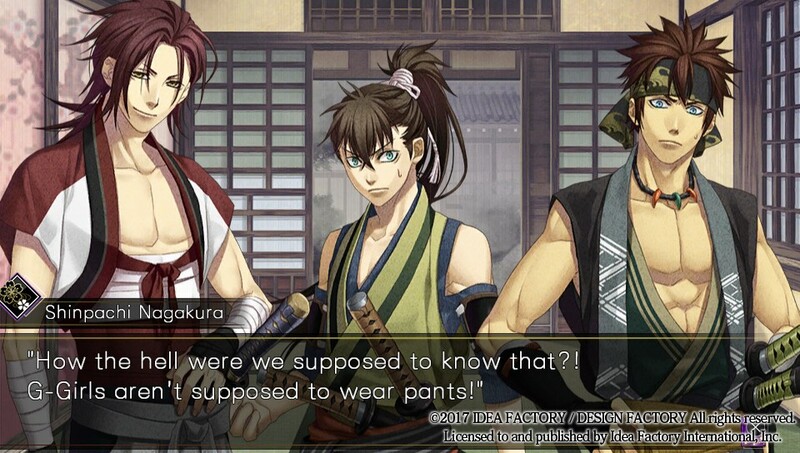 So, how good is Hakuoki: Kyoto Winds’ plot then? The answer to that and a look at Chizuru herself on the next page.